If you make a deviled egg mix with mustard, my first tip is to try dry mustard. It makes it more dry/less messy and more firm. 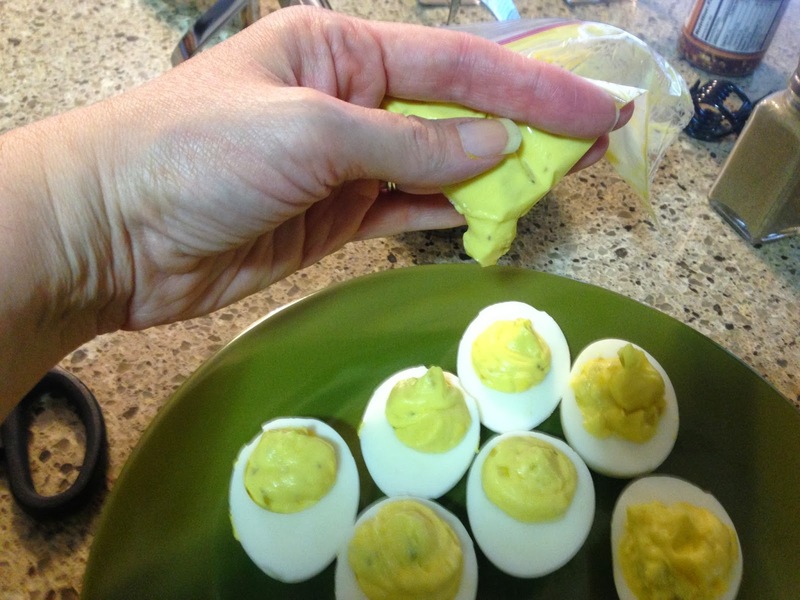 A perfect consistency for deviled eggs, versus egg salad where you may appreciate a wetter mix. 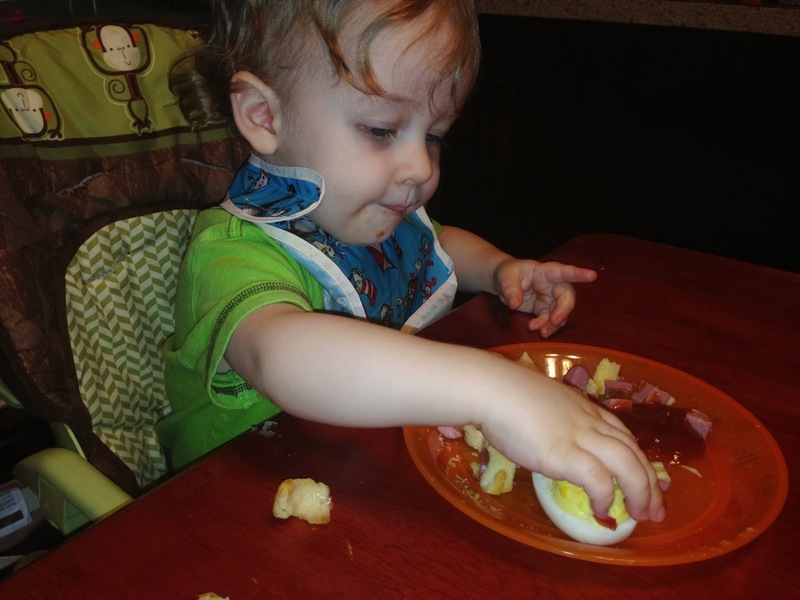 Second tip: Scoop your mix into a plastic bag and snip off the egg. This makes getting the mix into the white sooo much easier and quicker. 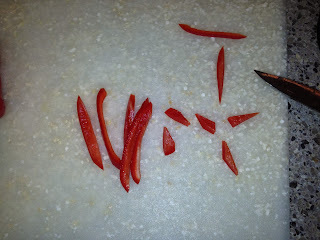 Then, just cut thin strips of a red pepper for the horns and tongue (beard?). I used the steams off spinach leaves for the eyebrows but you could use the green tops of of green onions. I didn't have any on hand and didn't have another use for them this week so I improvised. 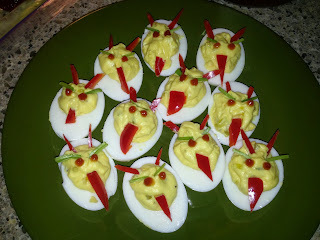 The Devil Eggs I got my inspiration from (Rachael Ray Everyday Magazine) used capers as the eyes. I don't care for capers so I certainly didn't want to buy them special just for this. I wasn't sure what I was going to use for the eyes at first, then I figured I'd use ketchup. But hmmm how to get them to look like eyes. 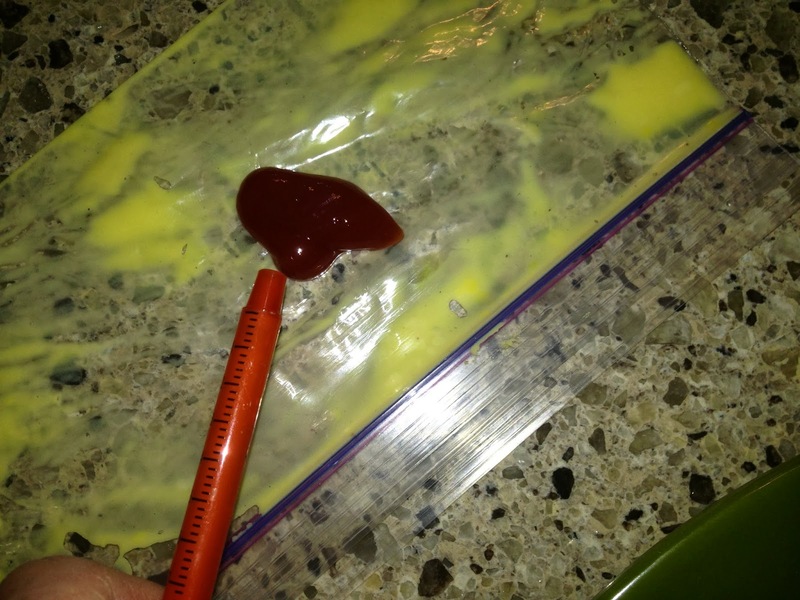 I thought about transferring dots of ketchup with the tip of a toothpick but when I went to where I store them, it hit me to try a clean medicine syringe. Genius, if I do say so myself! I just squirted a drop onto the empty plastic bag, cuz I didn't want to dirty up another dish...I am lazy, after all. It really was super easy! The little pumpkins are also pretty much self explanatory. 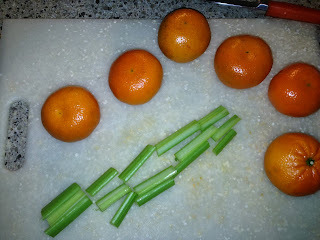 Peel a few tangerines, clementines etc then stick a piece of celery into the holes. Good thing I had extra "stems". 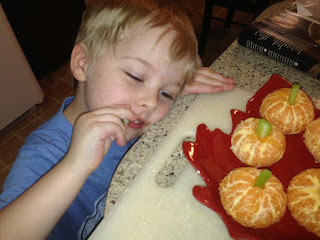 My veggie monster kept eating them while he was helping me make them. 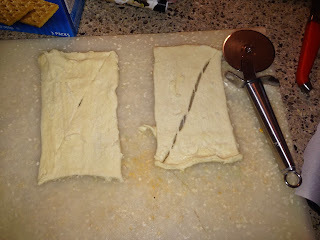 For the hot dog mummies, I just used crescent rolls that I cut into strips with a pizza cutter. 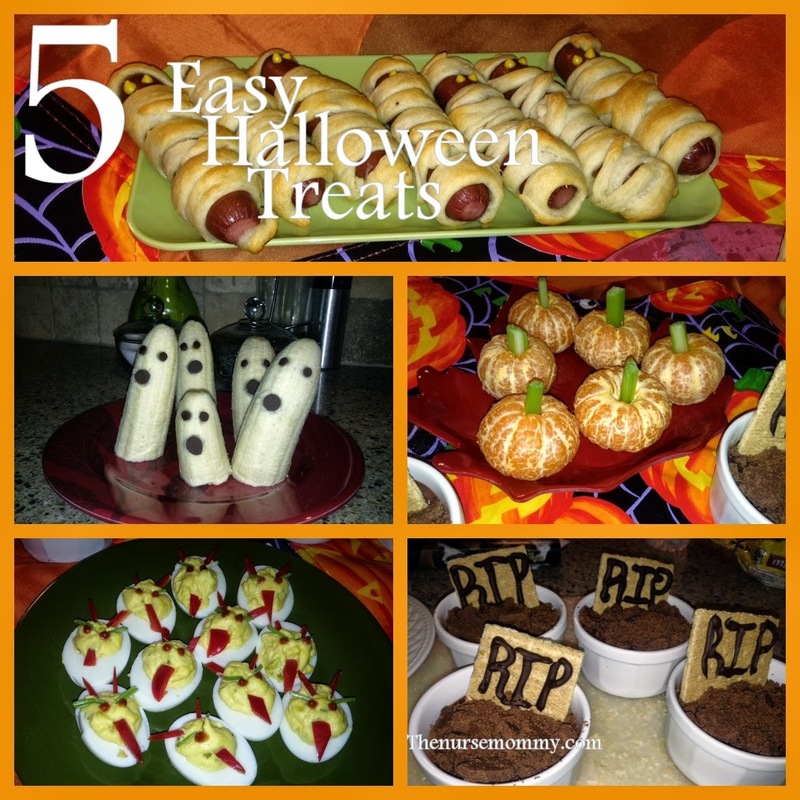 This helped them look more "ratty" like you'd imagine a mummy to look. I also used the medicine syringe trick for the eyes with mustard. Just cook them according to package directions, let them cool a bit before adding the eyes or they'll run. 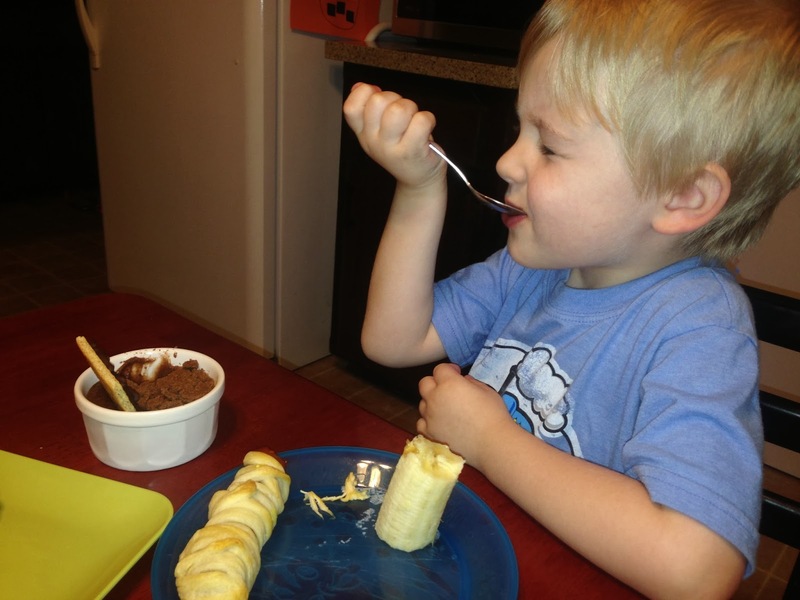 The RIP pudding is the only one that might need some kid of explanation. 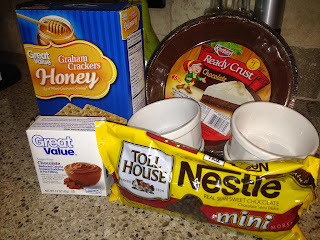 Firstly, you'll notice from the picture that instead of cookies for the "dirt", I used a chocolate pie crust. This was not only cheaper (by about $1), it was also quicker because I didn't have to separate the cookies. (I looked for, but didn't find the cookie crumbs. I know I've seen them before but I'm still sure this option was the cheapest). Get your pudding mixed and pour it into a spouted measuring cup for an easy way to divide the pudding into individual portions. Once that is done. 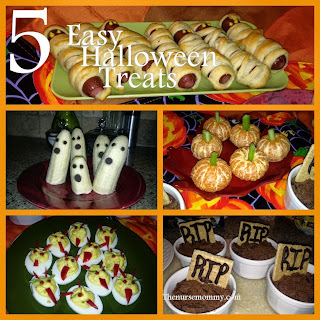 Pop them in the fridge while you work on the tombstones. Once again, the inspiration used a cookie that was more expensive. It used Milano cookies. Which are delicious, but ridiculously expensive. 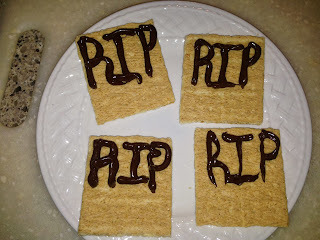 I opted for graham crackers. Cheap and I had them on hand. 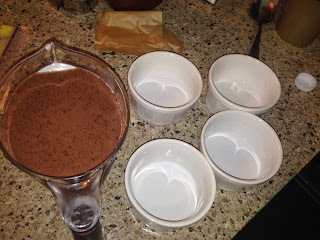 Put about 1/4 cup of chocolate chips into a glass dish. Melt them in the microwave on 50% strength. Do this in 20-30 second increments so you don't burn the chocolate. 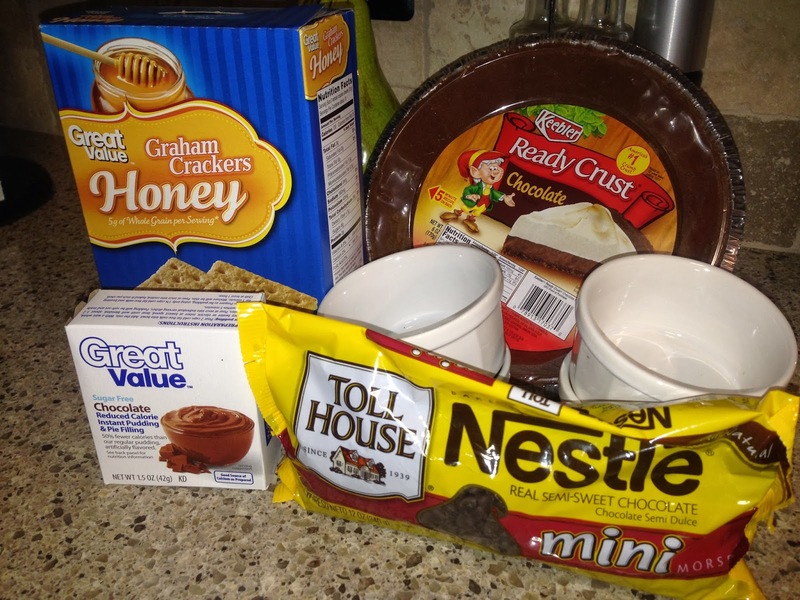 Have a rubber spatula and plastic freezer bag (you want a thicker bag so that it withstands the hot chocolate) ready. You wan to work quickly before the chocolate starts to set. Snip a little corner off the baggie. I couldn't take pictures of this process, as you can imagine. Pipe out RIP (or whatever you choose) and put the tombstones in the fridge on the plate so they can set up before you stick them in the mud. And there it is! 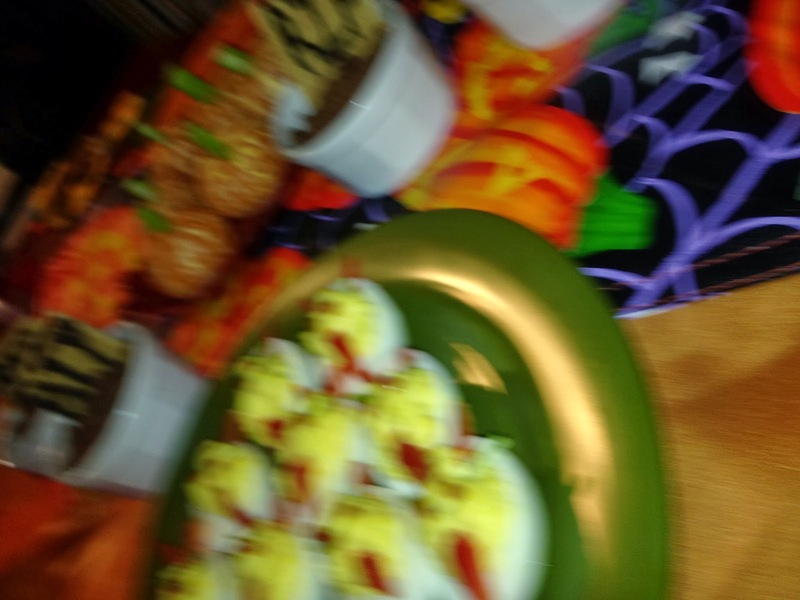 Our fun little Halloween dinner. I had a blast making these and the kids loved it. 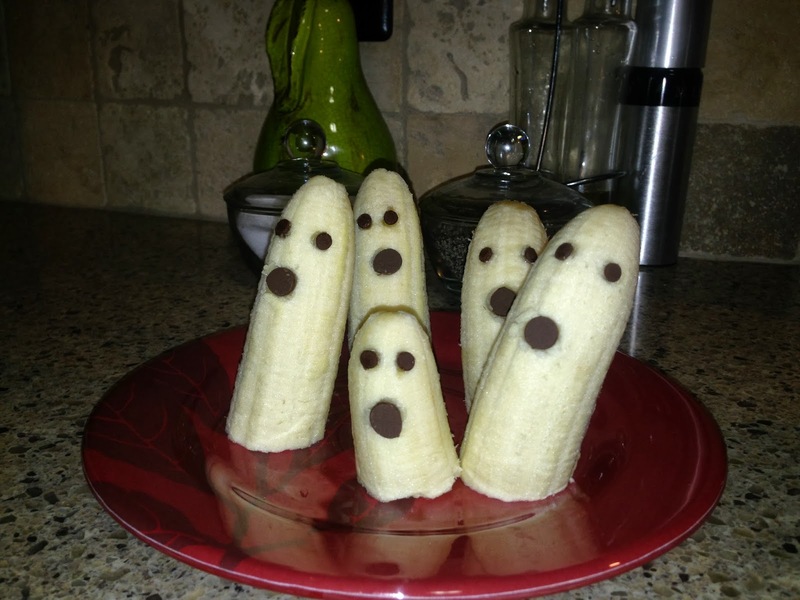 My littest especially loved the "Nanas". Yup, it was the first thing he ate.